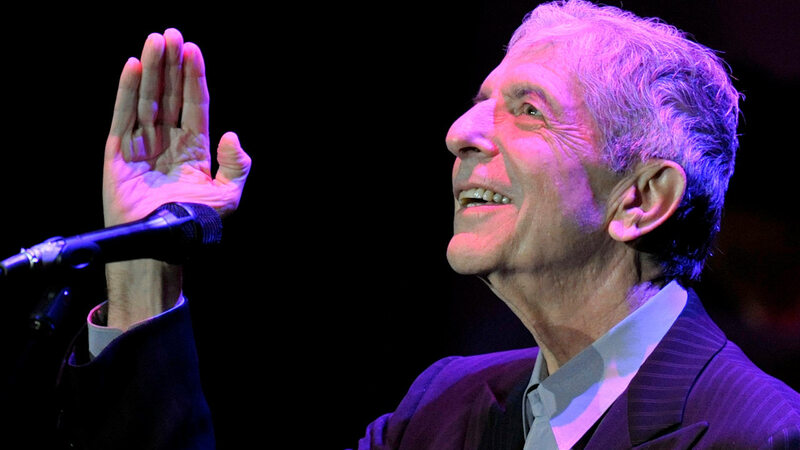 LOS ANGELES -- Leonard Cohen, the baritone-voiced Canadian singer-songwriter who seamlessly blended spirituality and sexuality in songs like "Hallelujah," "Suzanne" and "Bird on a Wire," has died at age 82, his son said. "My father passed away peacefully at his home in Los Angeles," Adam Cohen said in a statement Thursday. "He was writing up until his last moments with his unique brand of humor." Cohen, also renowned as a poet, novelist and aspiring Zen monk, blended folk music with a darker, sexual edge that won him fans around the world and among fellow musicians like Bob Dylan and R.E.M. He remained wildly popular into his 80s, when his deep voice plunged to seriously gravelly depths. He toured as recently as earlier this year and released a new album, "You Want it Darker," just last month. Adam Cohen said his father died with the knowledge that he'd made one of his greatest records. Cohen's "Hallelujah" went from cult hit to modern standard, now an unending staple on movies, TV shows, YouTube videos, reality shows and high school choir concerts. Cohen, who once said he got into music because he couldn't make a living as a poet, rose to prominence during the folk music revival of the 1960s. During those years, he traveled the folk circuit with younger artists like Dylan, Joni Mitchell, Joan Baez and others. His contemporary Kris Kristofferson once said that he wanted the opening lines to Cohen's "Bird on a Wire," on his tombstone. They would be a perfect epitaph for Cohen himself: "Like a bird on a wire, like a drunk in a midnight choir, I have tried in my way to be free." "Hamilton" star and creator Lin-Manuel Miranda quoted those lines on Twitter Thursday night as one of many paying tribute to Cohen. Mourners gathered and created a candle-lit shrine outside a home in Montreal, the city where Cohen was born. Cohen never seemed quite as comfortable on stage as he did writing and recording, chalking it up to being a late starter among his folk cohort. "I was at least 10 years older than the rest of them," he told Magazine, a supplement to the Spanish newspaper El Mundo, in 2001. Judy Collins, who had a hit with Cohen's song "Suzanne," once recalled he was so shy that he quit halfway through his first public performance of it and she had to coax him back onstage. Like Dylan, his voice lacked polish but rang with emotion. In 2016, Dylan told The New Yorker that Cohen's best work was "deep and truthful, "multidimensional" and "surprisingly melodic." "When people talk about Leonard, they fail to mention his melodies, which to me, along with his lyrics, are his greatest genius," Dylan said. "Even the counterpoint lines - they give a celestial character and melodic lift to every one of his songs. As far as I know, no one else comes close to this in modern music." It was Dylan who first recognized the potential of 1984's "Hallelujah, performing it twice in concert during the mid-1980s, once in Cohen's native Canada. It had gone unnoticed when it came out on an independent-label album that had been rejected by Cohen's label. He had filled a notebook with some 80 verses before recording the song, which he said despite its religious references to David, Bathseba and Samson was an attempt to give a nonreligious context to hallelujah, an expression of praise. Cohen recorded four verses, but he sent several more to John Cale, a founding Velvet Underground member who recorded "Hallelujah" for a 1991 tribute album. It's the Cale version that has become the standard and was used by its most celebrated singer, the late Jeff Buckley, whose 1994 recording really began the launch of the song as cultural phenomenon. Cohen was inducted into the Rock and Roll Hall of Fame in 2008, telling the audience: "This is a very unlikely occasion for me. It is not a distinction that I coveted or even dared dream about." In songs such as "Sisters of Mercy," Cohen melded romantic imagery with minimal orchestration to produce music that rang with the authenticity of traditional folk songs. Many had a dark mood, featuring black humor or sardonic social commentary. "Destroy another fetus now, We don't like children anyhow," was one of the lines from his song "The Future." Once asked if he was a pessimist, he responded with typical dark humor. "I don't consider myself a pessimist at all,' he told the London Daily Telegraph in 1993. "I think of a pessimist as someone who is waiting for it to rain. And I feel completely soaked to the skin." Cohen suffered bouts of depression throughout his life that he sometimes tried to mitigate with alcohol and drugs. When he gave his first U.S. concert in 15 years in early 2009, the 74-year-old received countless standing ovations from the sold-out crowd at New York's Beacon Theatre. "It's been a long time since I stood up on this stage in New York City," Cohen said. "I was 60 years old, just a kid with a crazy dream. Since then I've taken a lot of Prozac." Born Sept. 21, 1934, he formed a country music group called the Buckskin Boys while still in his teens. He was attending McGill University when his poetry book, "Let Us Compare Mythologies," was published in 1956 to critical acclaim. It was followed by "The Spice-Box of Earth" in 1961. His first novel, "The Favourite Game," came out in 1963. He published several more poetry collections while living on the Greek island of Hydra in the 1960s and began to get wide notice with his experimental novel "Beautiful Losers" in 1966 and his first album, "Songs of Leonard Cohen," in 1968. "Leonard Cohen seems on the verge of becoming a major spokesman for the aging pilgrims of his generation," The New York Times wrote in 1968. He told the Times interviewer: "I don't even think of myself as a writer, singer or whatever. The occupation of being a man is so much more." In all, he published more than a dozen novels and books of poetry and recorded nearly two dozen albums. Born to a Jewish family, Cohen considered himself both a Jew and a Buddhist. For decades, Cohen was a student and friend of Joshu Sasaki Roshi, a Zen Buddhist monk, and from 1994 to 1999 he lived as a disciple of Roshi's at the Mount Baldy Zen Center in Los Angeles. He claimed not to fully understand Buddhist concepts, but he said the retreat and its hard work gave him a better sense of himself. "I was the cook up there," he told Magazine. "My life was filled with great disorder, with chaos, and I achieved a little discipline there. So I decided to return to music." He continued to write and produce albums and books. Cohen never married but he had two children, Adam and Lorca, with artist Suzanne Elrod. He never won a Grammy, but he won countless other awards, including being named a companion of the Order of Canada in 1991, his native country's highest civilian honor. "No other artist's music felt or sounded like Leonard Cohen's," Canadian Prime Minister Justin Trudeau said in a statement Thursday. "Yet his work resonated across generations. Canada and the world will miss him." One of Cohen's most beloved hits was 1967's "So Long Marianne," written for former girlfriend and longtime friend Marianne Ihlen, who also inspired his song "Hey, That's No Way to Say Goodbye." "Well Marianne, it's come to this time when we are really so old and our bodies are falling apart and I think I will follow you very soon. Know that I am so close behind you that if you stretch out your hand, I think you can reach mine." Ihlen received the letter two days before her death.